The eternal war between structure and chaos took another turn in the third round of the Six Nations tournament two weeks ago. An intensely well-drilled Ireland side just about held off deconstructed Wales in Dublin, while what captain John Barclay describes as the ‘organised chaos’ of the Scotland attack laid waste to Eddie’s England in Edinburgh. We can call it an honourable draw. It was a historic day at Murrayfield. 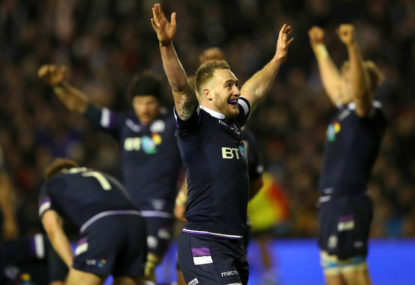 It was not only the first time in ten years that Scotland had managed to win a game against England on their home ground, it was also the first time that they had even scored a try against the ‘auld enemy’ in a decade. During my time with Stuart Lancaster’s England, we played Scotland three times in four years at Murrayfield without conceding anything but penalties. That has all changed under the superior attack coaching of first Vern Cotter and latterly, Gregor Townsend. Scotland have now scored 33 tries in their last nine games with Townsend in charge, an All Black-like ratio of almost four tries per game. Scotland centre Huw Jones broke the ice in the 15th minute, and after that it became like a stream of London buses. Where one arrived, two others swiftly followed in the course of the first half. The Murrayfield encounter was a tantalising foretaste of what might await in the titanic Twickenham match-up between England and New Zealand later this year. The Scotland team modelled by Cotter and Townsend is a Northern Hemisphere/New Zealand hybrid with typical Kiwi attributes. Last month I wrote an article examining England’s chances of beating the All Blacks when they tour Europe in November. I pointed out the importance of the English kicking game in their overall game-construction, and at Murrayfield Scotland went about their business with a purpose, neutralising it completely. They won the kicking duels for territory and it was not until the 68th minute of the match that England won a high ball back. Add to this no fewer than eight Scotland turnovers at an under-resourced (and unsympathetically refereed) English breakdown, and Scotland were in A1 position to play their game. How they went on to exploit this foundation with their attacking play will be of particular interest to New Zealand, with the arsenal of weapons at their disposal. The underlying principle of the English defence is that of the ‘super-rush’. They are not afraid to fire players right up on to the opposition receivers, and frequently well past the ball, in order to create pressure on handling and decision-making. This idea would have alarmed England World Cup-winning defence coach Phil Larder – who always coached his defenders to stay in front of the ball-carrier and his options at all times – but it is a sign of changing times in the game as a whole. In the first case, Danny Care is away for the intercept try, in the second Courtney Lawes causes a fumble which again led to a ‘try’ at the other end of the field. Fortunately for Scotland, both were called back by referee Nigel Owens for an illegality at the breakdown by Joe Launchbury and a knock-on in the tackle by Lawes. Scotland have only made three short link passes, but already the highest England defender (Owen Farrell) is more then ten metres upfield from the base of the previous ruck, and five metres past the ball. Scotland use the depth of their attacking alignment to pull England’s super-rush as far upfield as possible, before matching up a forward (prop Gordon Reid) in contact against England’s smallest and least physical defensive back (George Ford). Under no pressure, Reid is able to turn and offload to a support runner who has broken underneath Farrell’s rush (Peter Horne). There is little doubt that Scotland would have scored if Horne’s pass to the men outside him had been more accurate. 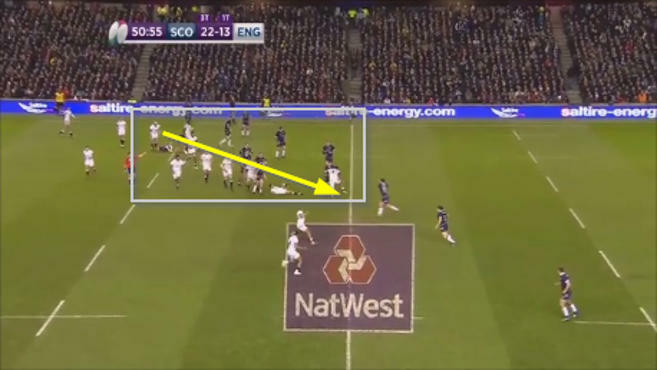 Another bit of profitable organised chaos (a tapped penalty taken on the Scottish 22) led to a similar counter from deep, which eventually resulted in Scotland’s second try of the first half. The remainder of this terrific sequence of play can be viewed on this highlight reel at 2:35 – 3:15. Of the five fully-competitive teams in the Six Nations, two (Wales and Scotland) have effectively become New Zealand/Northern Hemisphere hybrids geared to play their best rugby in ‘organised chaos’. The other three remain firmly on structured turf, although both Ireland and England are both set up to adapt to chaos in specific circumstances. The ebb and flow of power between the two philosophies has been fascinating to watch over the past few weeks. In a sense, Scotland finished the chances Wales were able to create but could not convert against England at Murrayfield. Wales, meanwhile, nearly upset Ireland on a meagre 30 per cent diet of possession, creating one clean break for every six rucks they built, compared to Ireland’s one in 13 ratio. All of which will interest the All Blacks greatly as they prepare for their showdown with England on November 10. New Zealand are the experts at both locating and playing through organised chaos, in situations where their advantage in individual skill-sets can be seen to its best effect. When the two teams collide in the autumn, it will not just be a battle between (at the time of speaking) the number one and number two ranked sides in the world, it will be a clash of philosophies about how to play the game of rugby and a definite clue to the future evolution of the game. Nick Bishop has worked as a rugby analyst and advisor to Graham Henry (1999-2003), Mike Ruddock (2004-2005) and most recently Stuart Lancaster (2011-2015). He also worked on the 2001 British & Irish Lions tour to Australia and produced his first rugby book with Graham Henry at the end of the tour. Three more rugby books have followed, all of which have either been nominated for or won national sports book awards. Nick's latest is a biography of Phil Larder, the first top Rugby League coach to successfully transfer over to Union, entitled The Iron Curtain. He is currently writing articles for The Roar and The Rugby Site, and working as a strategy consultant to Stuart Lancaster and the Leinster coaching staff for their European matches.